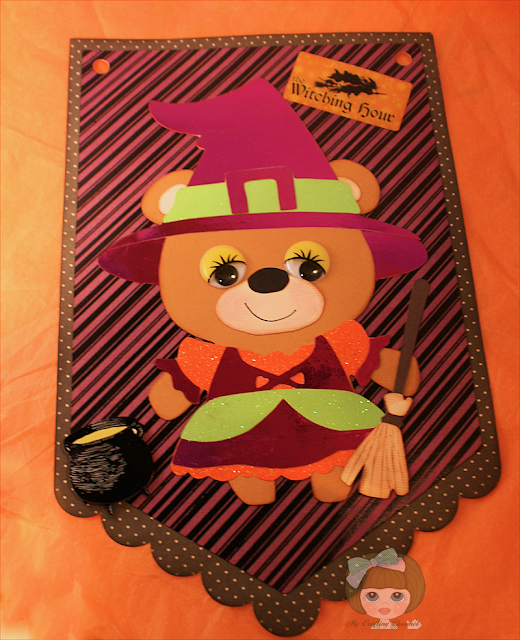 My Crafting Channel: Teddy Bear Parade #31 "Witch"
Teddy Bear Parade #31 "Witch"
Today I have for you one of the Pennants that I'm making for Corbin to hang on the fireplace. This very hard to take pics of. All the papers where shinny and or glittery. Each pennant will be 7 inches wide and 10 3/4 tall. There will be 5 pennants total. She is to cute to be a witch, your little guy is going to love it! Gorgeous Nana, I like her flashy outfit and her beautiful eyes. She is amazing! Corbin is so lucky to have such a talented caring Nana! I love her strong colors and the design. You are a PRO at matching up the eyes with the character! love her shiny outfit, adorable Nana!! Well this little witch is adorable! I just love all her sparkle and shine! This is just adorable! Love the google eyes and the outfit! Have a great day. Adorable! can not wait to see the rest of the banner!!! ADORABLE!! I Love it!!! Can hug the bear? She's is just so cute... too adorable! This is such a happy and fun series of cards!!! Waiting to see your banners too! Just so so so cute. Super adorable witch, love her eyes! !